The collaborative artwork by Anthony Ortega, Casey Kawaguchi, and Jon Lang at the Bonanza Campout Music Festival. It's the headlining musical artists that bring people to music festivals, but it's often the art installations that offer a key element of the experience once you've arrived. In its second year, Bonanza Campout's art installations have a way to go before they reach the level of the massive and extensive art pieces displayed at events like Burning Man or Coachella. 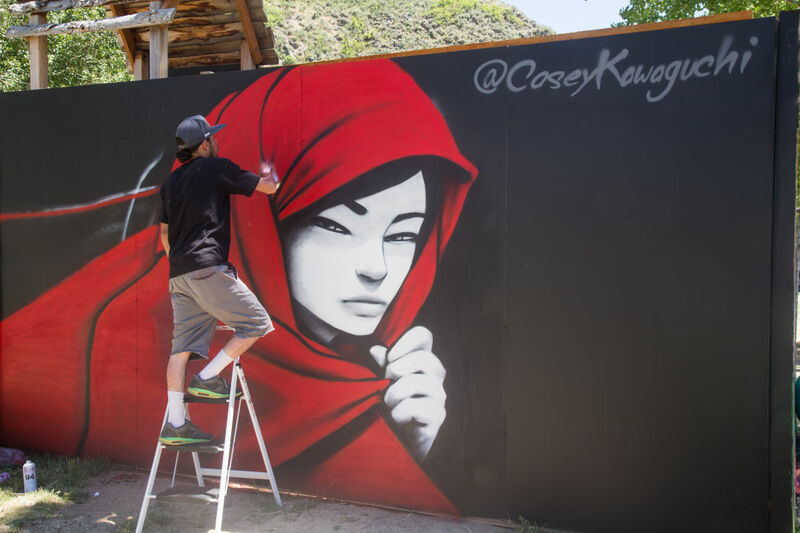 But Bonanza's organizers still managed to make art a highlight of this fledgling festival by bringing on graffiti artists Casey Kawaguchi, Anthony Ortega, and Jon Lang. 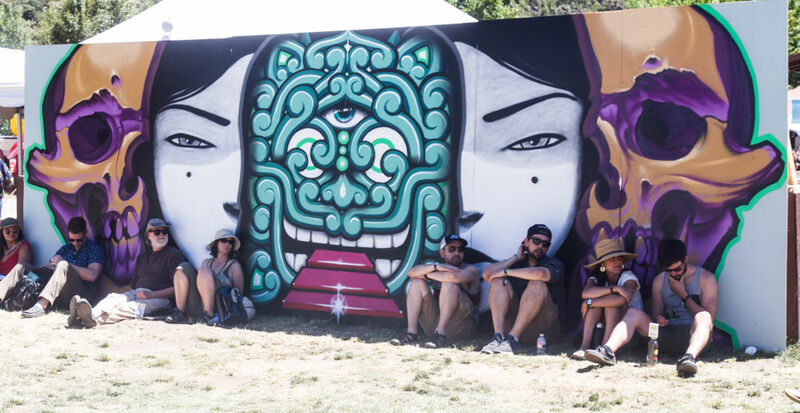 The three artists collaborated on a wall at the entrance to the Bonanza stage (pictured above) ahead of the Friday opening date. They spent most of their time conceptualizing the piece to ensure their unique styles would come together well. The end result was three faces, nestled inside one another. Ortega created the psychedelic center, Kawaguchi the woman, and Lang designed and painted the outside skeleton. For the remainder of the festival, each artists worked sporadically on solo pieces, offering guests the chance to see a creation come to life right before them. If you keep up with Salt Lake City's street art scene, you've probably heard of Utah born and raised, Casey Kawaguchi. Now living in Denver, Kawaguchi returned to Utah to share his art at the Bonanza Campout. Kawaguchi's art is heavily inspired by his heritage. "I've been drawing since I can remember," says Kawaguchi. "As I got older, I really started to draw from Japanese images and focus on close-ups, especially the eyes." It's easy to spot his distinctive artwork, usually portraying females and relying heavily on boldly contrasted blacks, whites, and reds. You can see more of his work via Instagram. Anthony Ortega working on one of his pieces, which featured a caterpillar and spider amidst a colorful array of mushrooms and leaves. Hailing from Reno, Nevada, Anthony Ortega is a tattoo artist who also dabbles in graffiti art. "I really love psychedelic designs and using lots of bright colors," says Ortega. He's completed a number of permanent murals in Las Vegas and other locations as well as other festival installations, including Lighting in a Bottle and Symbiosis. 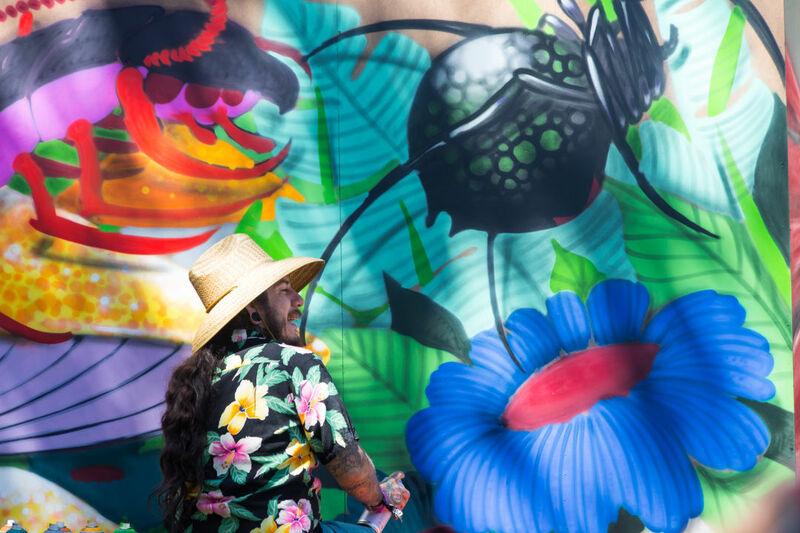 In addition to the collaborative piece, he also painted a for a wall mural featuring a dog, surfer dude style, and a vibrant scene of a caterpillar and spider perched atop some large mushrooms. You can see more of his work via his website or Instagram. 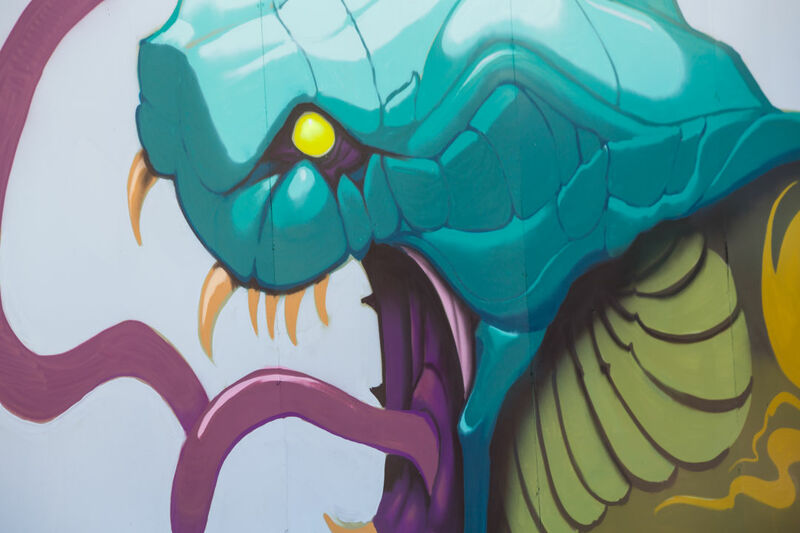 Salt Lake City-based artist Jon Lang chose to depict a vast serpent in his solo piece. "We worked really hard on the collaborative piece, so I wanted to do something really familiar, almost second-nature for the solo project," said Lang. Even with something you're used to painting it can be tough to stop working; Lang could be seen stepping back from his work over and over again, deciding just where to add the last highlights. You can catch him in Salt Lake City at Twenty Seven Tattoo Studio (535 S 700 East) or follow him on Instagram.